Every year about this time, I am SO over wintery weather. That storm on Saturday was oh so cruel even though not totally unexpected. Today I'm daydreaming of sunshine, sandals and no more snow. I also start thinking about baseball! Today is Opening Day and The Home Opener is right around the corner (Friday 4/4!!) and I can't wait to get back to Tribe baseball again. If you're like me and are afraid of the opening day weather, there's a great way to experience Progressive Field without freezing AND help a wonderful organization at the same time. Even if you don't like baseball this is an event for everyone. 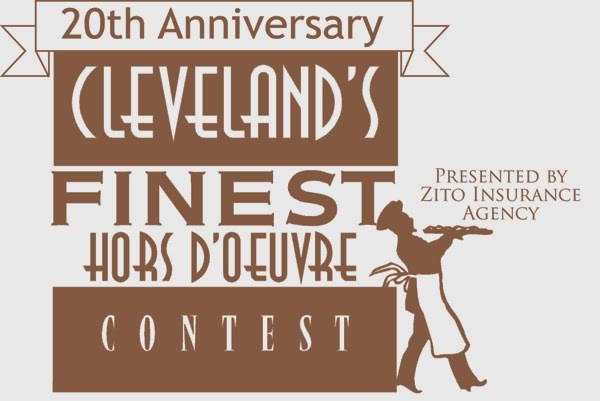 Our Lady of the Wayside's Cleveland's Finest Hors D'oeuvre Contest is Thursday April 10th at the Terrace Club. From 6-9pm you'll get to experience some of the city's finest restaurants as they show off their tasty appetizers. The event also includes wine and beer to pair with the tasty nibbles. The food is plentiful and delicious! And doesn't everything taste better at the ballpark? Desiray Cross and Tim Richards from WDOK The New 102 will be the hosts and YOU get to be the judge. Voting for your favorites might seem easy but last year there were so many great choices it was hard to choose! Their will be a silent auction and chinese raffle as well as music by local singer-songwriter Nate Jones. Our Lady of the Wayside is a great local charity that helps a lot of people. It's always a fun event and a delicious way to try food from a ton of great restaurants at one time. I like trying a little bit of everything so appetizers as a meal is one of my favorite ways to dine. This year is the 20th anniversary of the event. People keep coming back year after year and it's one of Our Lady's biggest fundraisers of the year. They help 500 developmentally disabled children and adults every year. By attending this event, you can help them help those in need. Tickets are $80 per person. Order yours by clicking here. I also have two tickets to give away to one lucky winner! There are three easy ways to enter. Like Our Lady of the Wayside and Eat*Drink*Cleveland on Facebook. Leave a comment below telling me you did with a link to your Facebook page.
" Nibble, sip and vote for your favorite #CLE hors d'oeurves with @OurLadyWayside - #win tix here http://ow.ly/vdcUq "
Leave a comment with the link to your Tweet in the comments below. Leave a comment telling me what participating restaurant you are most looking forward to trying. You can Tweet daily for additional entries, just be sure to leave a separate comment for each day. Contest ends Friday 4/4 at midnight. Make sure that you leave your name and a way to contact you so we can notify you if you win. Winner will be chosen by Random.org and will be announced on Monday 4/7. If you know me, you know I love pizza. So when my hubby said that one of his friends was opening a new pizza shop, I had to check it out. 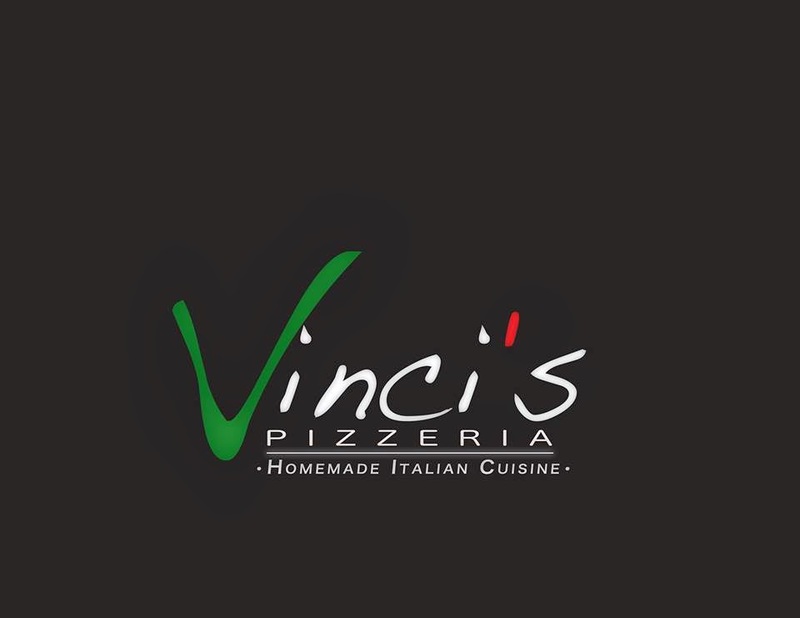 Pete Maniaci and his son Paulo opened Vinci's Pizzeria because of their love for food and their desire to share it with the rest of us. Family recipes are used for everything they make - nothing comes frozen in a box here. 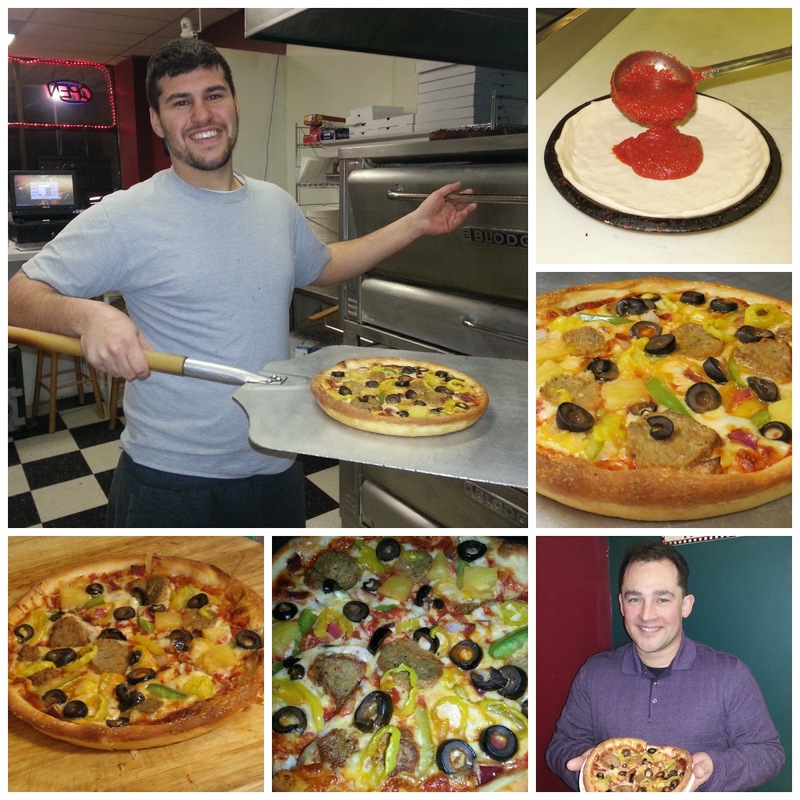 Fresh ingredients are used and everything is made to order. Pete actually ended up inviting us to check out the new place so we could sample the menu and see what we thought. Boy were we in for a feast! When we walked in we were greeted by this sign. I like how these guys think! They treated us to a great assortment of menu items - enough for 4 people at least - and we left with full and happy bellies...and lots of leftovers. The calamari was lightly breaded and tender and served with a delicious marinara sauce. 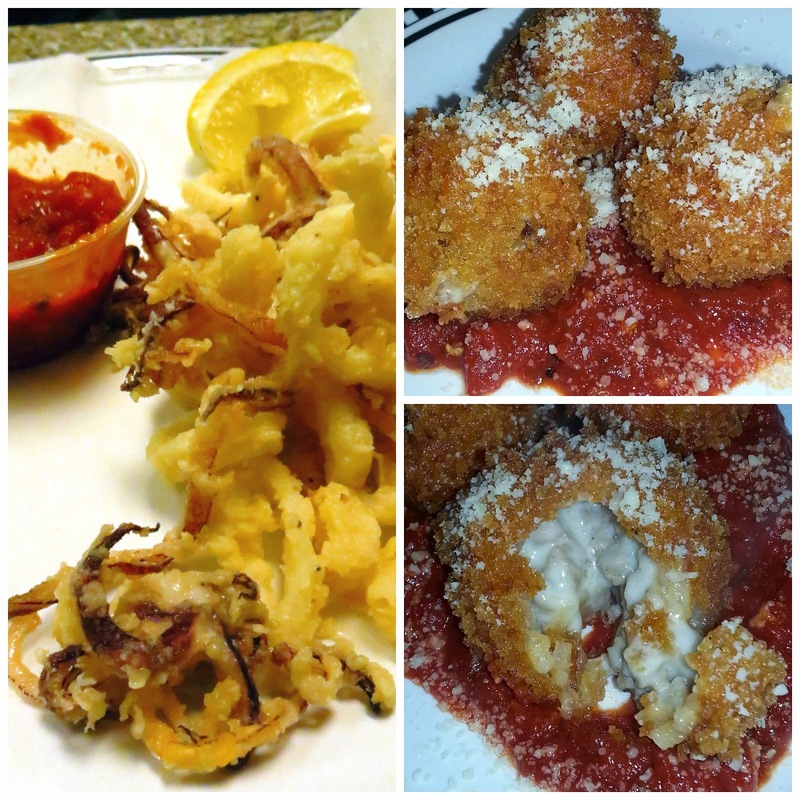 The arancini are risotto balls stuffed with creamy cheese and sausage. 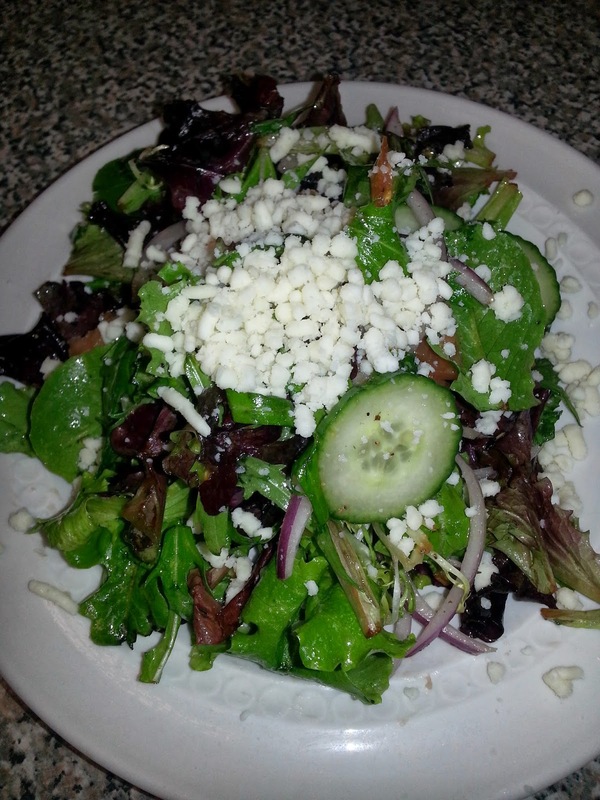 It was a mix of spring greens, sliced red onions, English cucumbers and lots of cheese. Next up was the garlic bread. 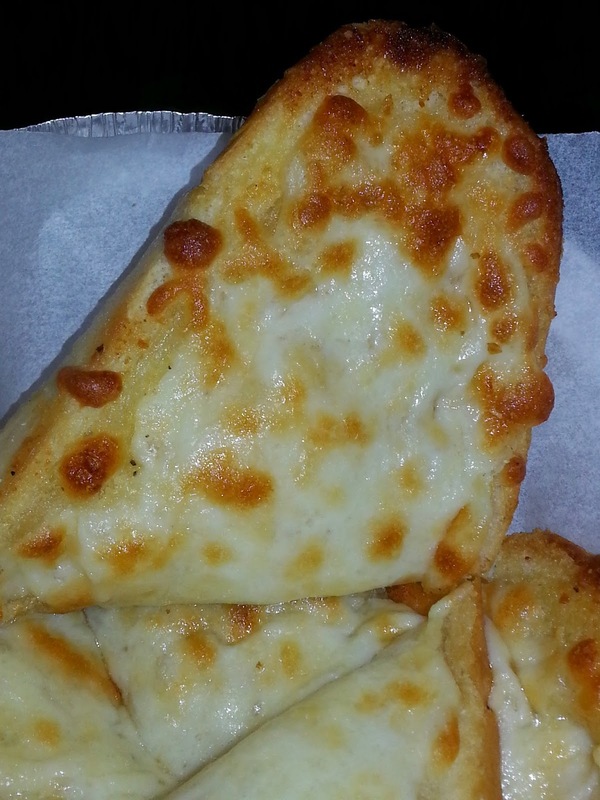 It was crunchy, garlicky and cheesy - and sooooo good! I could have eaten the whole basket. 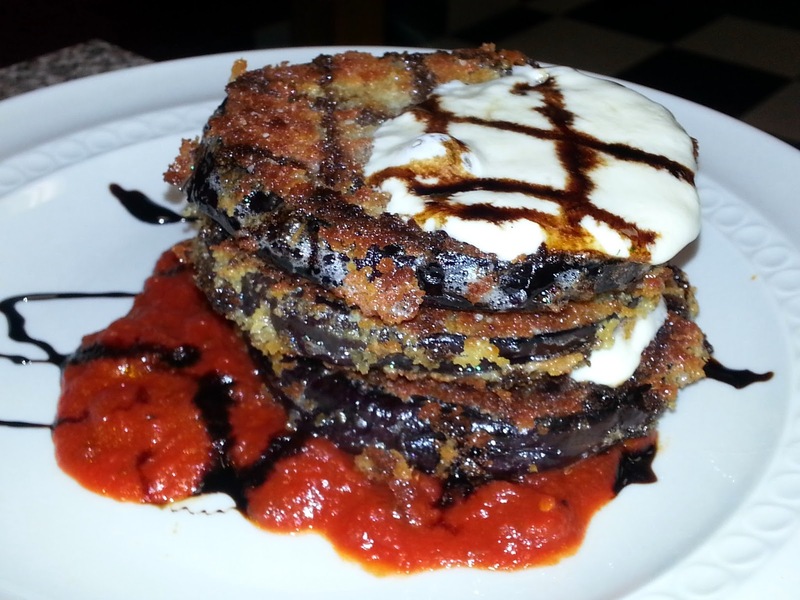 The next course was the eggplant stack. It's a fancied up version of eggplant parmesan that was a step up from the old familiar dish on every menu. I'm not normally a huge fan of eggplant parmesan because of all the breading and how it gets soggy from the sauce. This version wasn't soggy at all because the breaded eggplant was only topped with slices of fresh mozzarella and a drizzle of balsamic glaze. We would have liked the eggplant to be sliced a little thinner but overall it's a winner. And we had pizza of course! Ours had meatballs, green peppers, black olives, onions, hot peppers and pineapple (on 1/2.) It reminds me of Farinacci's in Northfield because the crust is super crunchy and a bit shiny from a coat of oil on the dough. Grandma's dough recipe, fresh toppings and lots of love go into every pie. In addition to pizza, they will be offering weekly specials that feature some fabulous Italian-American favorites cooked to order using fresh ingredients. 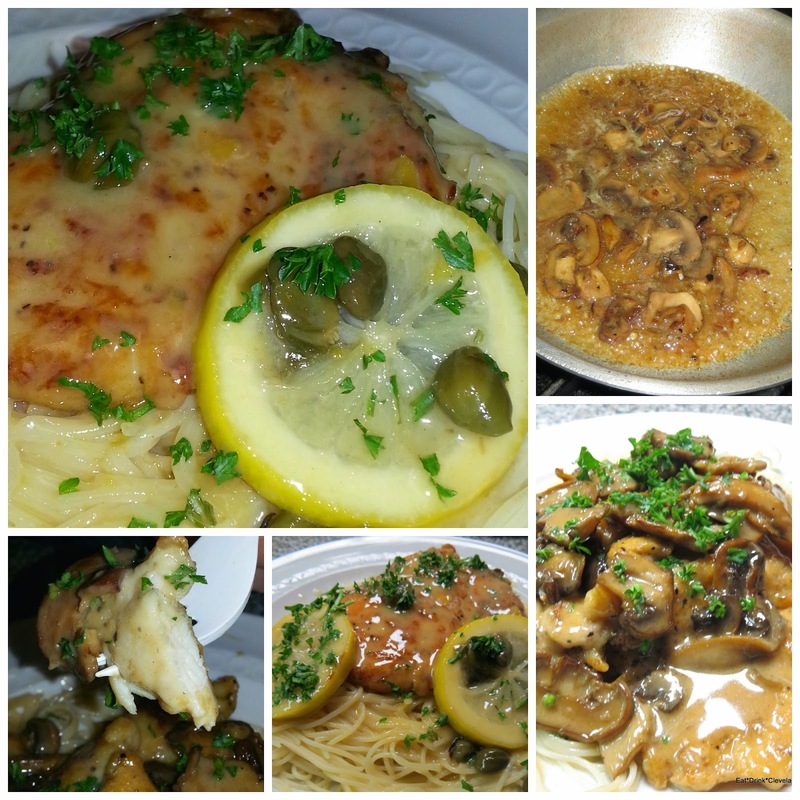 We sampled two chicken dishes - piccata and marsala. Both featured very thin and tender chicken with delicious sauces over angel hair pasta. For me, the marsala stole the show - it was so delicious! If they are offering it, you must order it and taste it for yourself. Yum! 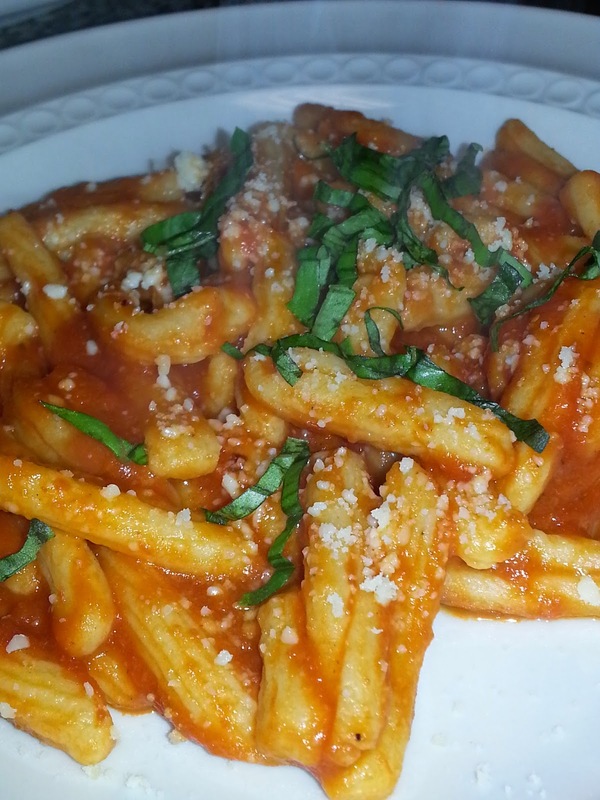 We also tried the homemade cavatelli - and we were not disappointed. They had the perfect amount of chewiness without being heavy. Notice the fresh basil and a dusting of parmesan? These guys pay attention to the details. Another pasta we tried was the baked pasta. It's an item that's on the regular menu and available year round. 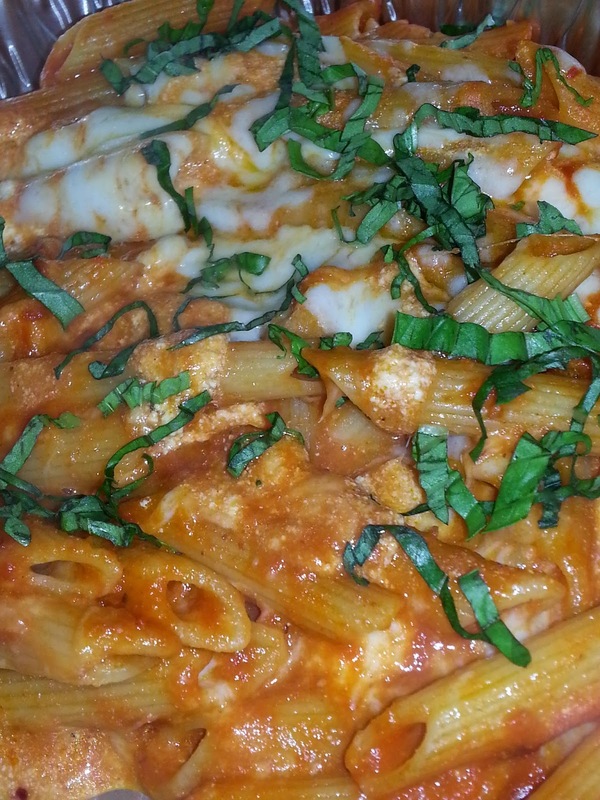 This is penne rigate, marinara, ricotta and mozzarella all baked together - definitely a crowd pleaser. When they started talking about dessert I really thought I couldn't fit in even one single bite. 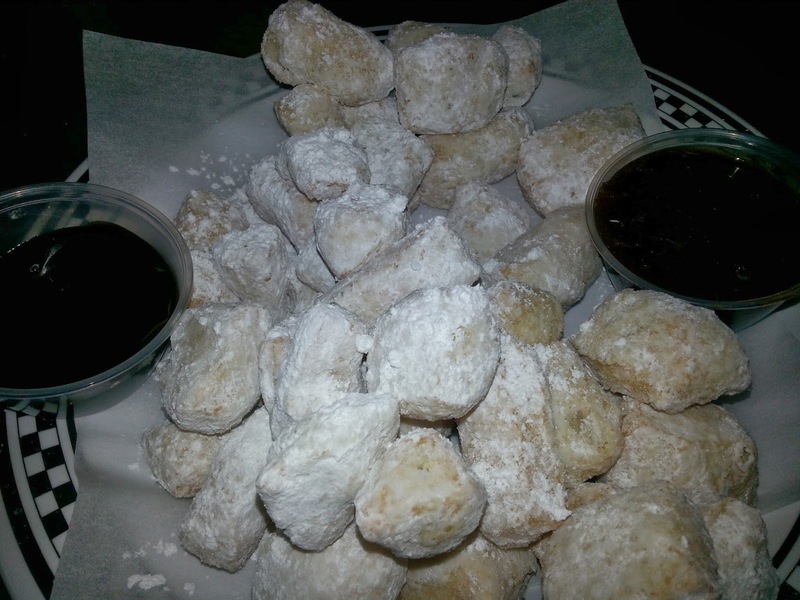 But the fried dough dusted with powdered sugar couldn't be resisted. Especially with homemade caramel sauces. They also have chicken wings and a full lunch menu. All the sandwiches are served on homemade bread. Seriously. And during Lent, they offer a fried tilapia sandwich and other specials. Click here for the whole menu. And if you're in the area, they deliver too. There are a couple tables that you can eat at but it's really a pizza shop, not a restaurant. 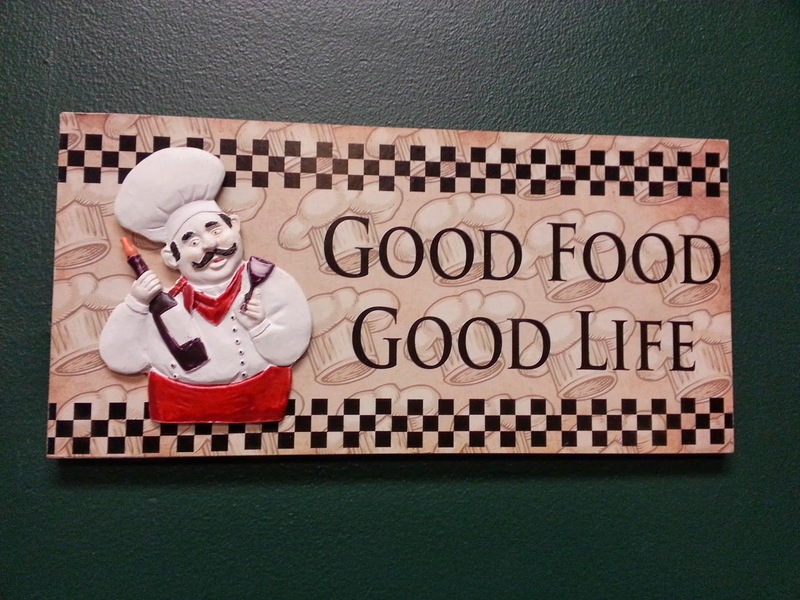 Order ahead, pick up your food, and head home for a home cooked meal without the dishes! To find out about their weekly specials and flash sales, like the on Facebook or follow them on Twitter. Ready for a new show Cleveland? The Cleveland Home + Remodeling Expo is March 14 -16 and will be held at the brand new Convention Center. If you're like me and been wanting to check out the Convention Center, this is the excuse you've been looking for! Celebrities! Ty Pennington, Nicole Curtis and Ramsin Khachi will be presenting this year. Check out the stage schedule and make sure you catch them in action. 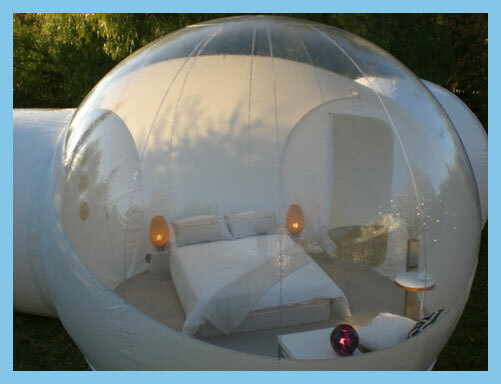 Casa Bubble You'll definitely be the talk of the neighborhood with THIS transparent room in your backyard. It looks kind of crazy but really cool. Why didn't I think of that! The Grow Cleveland Pavilion sponsored by Whole Foods really puts the emphasis on how you can make the most of your city living with tips, trends and even advice on urban gardening. Yes you CAN grow a garden in your city yard! Whole Foods will be sampling foods and there will be a farmers market set up too. If you missed the Home + Garden Show, you can still get your pre-spring outdoor fix at the Outdoor Living Oasis. Sounds like a fun show right? You can get your tickets here. Use promo code EDCLEVE to receive $ off per ticket. 2. Follow @GreatBigShow and @EatDrinkClev on Twitter. Leave a comment telling me you did. and leave a comment telling me you did. 4. Follow Home + Garden Events and Eat*Drink*Cleveland on Facebook and leave a comment telling me you did. You can Tweet daily for extra entries, just leave a comment each time. Remember to leave a separate blog comment for each individual entry. The contest ends Sunday 3/9 at midnight. Winner will be announced Monday 3/10. Good luck and hope to see you there! When I was in high school and college, I took French. 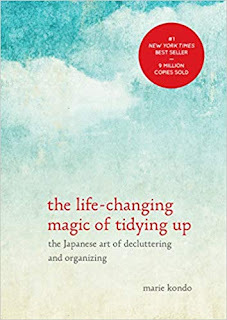 Since then, I've taken classes in many other languages and firmly believe that everyone should take at least one foreign language class in their life. It really helps you to properly pronounce words, especially when ordering food. Restaurant menus and wine lists can be really intimidating, especially when the items listed have foreign names. It's worth it to do a little research to find out what these crazy named things are and how to ask for them without feeling foolish. There will always be those words that trip you up, but half of the problem is not even knowing you're saying the word wrong because practically everyone else does the same. Sometimes when the correct pronunciation is used, people will just stare at you blankly because they have no idea what you're talking about. "Pho" and "gyro" are perfect examples. One of my top pet peeves is the word for those tender little Italian potato dumplings ~ gnocchi. Please for the love of God, stop calling them "nooky" or "no-key!" Think of lasagna. In Italian, the combo of gn = ny. This will help you remember that it's NYO-kee. I recently watched this video from Foodbeast and wanted to pass it along because I'm sure there's at least one word in this list that you struggle with. For years I mispronounced bruschetta because that's how everyone I knew said it. Now if I say it properly, most people look at me like I'm a weirdo. I'm notoriously tongue tied when I try to say Worcestershire sauce. I visited my friend in Charlotte, NC years ago and a lady down there called it woo woo sauce. So much easier! How many of us know how to say poutine? This guy shows us how to say it properly and for some reason, he cracks me up while doing it. Another one of my tricky words is saucisson and thanks to Melissa Khoury, I now have reasons to actually say it. Saucisson Cleveland is the name of her amazing artisan cured meats and sausage company. She is Cleveland's queen of pork and you can find her at the Downtown Cleveland Market on Fridays and at the North Union Farmer's Market on Saturday. What word always causes you problems? What's your pet peeve?